Decoding Denver Backfield Value Den: Royce Freeman or Phillip Lindsay? Each offseason, free agency and the NFL draft muddy the waters of teams’ backfields, as well as those of dynasty teams. However, given the contracts of the Denver Broncos’ major contributing running backs from 2018, which running backs will be involved in 2019 is already clear. With the help of advanced stats, metrics and analytics player profiles, we can also predict which ones are most likely to be viable fantasy assets in 2019 and beyond. 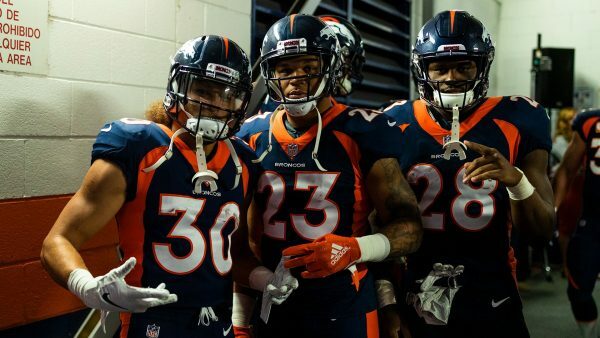 All three of Devontae Booker, Phillip Lindsay, and Royce Freeman are on their rookie deals through 2019, 2020 and 2021, respectively. Each are set to make less than $720,000 in 2019. With inexpensive contracts in tow, all three backs will likely remain on the Broncos’ 2019 roster. Thus, Denver is unlikely to invest significant salary or draft capital on a running back this offseason. Given the backfield personnel stability and quarterback and offensive line upgrades on the horizon, Denver’s running back corps represents a value creation buying opportunity in dynasty leagues. Royce Freeman’s college profile and 2018 performance are tempting, tantalizing and provocative. Freeman’s advanced prospect profile is arousing, evidenced by a 107.8 (86th-percentile) Speed Score, 11.06 (83rd-percentile) Agility Score, and a 6.0 college yards per carry. In his first year of professional football, Freeman’s 1.28 yards created per carry ranked No. 30 and his 24.3-percent Juke Rate ranked No. 32, despite his limited opportunities in 2018. Freeman’s rushing inefficiency, highlighted by a -15.8 Production Premium (No. 60), and anemic reception total (despite eight catches in Week 17 with Lindsay inactive) are the warning flairs in the sky suggesting Freeman may be ill-equipped to become a true NFL bell cow back. Zooming out, Freeman’s size, athleticism, and college production put him in rare company. Fortunately, the risk that he never achieves fantasy RB1 status is now build into his dynasty trade value. The risk is low, and the reward is high. Phillip Lindsay doesn’t have draft capital or prototypical three-down back size. But over the season, his opportunities and production continued to rise. He was an effective runner, evidenced by a 4.9 True Yards Per Carry, which ranked with No. 7 among qualified NFL running backs and a 25.6-percent Dominator Rating (No. 15). On the other hand, metrics that measure power and elusiveness independently of a running back’s supporting cast suggest Lindsay’s benefited greatly from random events and outcomes on the football field in 2018. While Lindsay’s 18.5-percent Juke Rate and 0.98 Yards Created Per Carry both ranked outside the top-40 running backs, the Broncos’ 105.7 run blocking efficiency rating ranked No. 3 in the league whenever Lindsay touched the ball. Few backs accrued more value than Lindsay last season, but few backs were as lucky. Lindsay displayed prolific receiving skills in college, evidenced by a 14.6-percent (92nd-percentile) college target share, and at 5-7, 184-pounds, Lindsay offers a prototypical satellite back profile. In this context, 2.3 receptions per game significantly underwhelmed in 2018. In summary, Lindsay’s rushing production was propped up by his supporting cast, and his receiving skills were never fully realized. Diminutive backs also rare sustain featured back workloads in the NFL. Despite a breakout rookie season, Lindsay’s risk is higher and his upside is lower than Royce Freeman, a classic sell-high candidate in dynasty leagues. Devontae Booker‘s best comparable is LeSean McCoy due to similar high college target shares and College Dominator Ratings. However, Booker’s production over the last two years is closer to Shane Vereen than McCoy. Although Booker was an adequate receiver out of the backfield in 2018, evidenced by a 74.5-percent (No. 20) catch rate, when he ran he failed to evade tackles on limited carries, ranking No. 92 in yards created per carry last season. Because Booker is on an inexpensive contract for 2019, he will see a role, though reduced, in the Broncos receiving game. However, this fringe role is insufficient to be a reliable fantasy asset in 2019 and beyond. It’s time to end the Booker experience in dynasty.